Paccia Marciana, a Libyan-Punic woman of Roman origin. Severus and Marciana married around 175 and she died before Severus married Domna. They had no children. 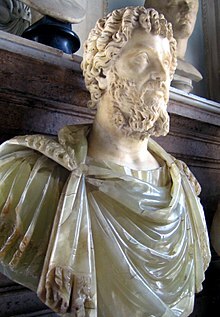 Severus (Lucius Septimius Severus, 11 April 145 AD – 4 February 211) was Roman Emperor from 193 AD to 211. 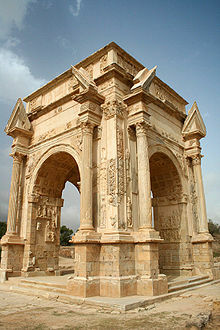 Severus was born in Leptis Magna in the province of Africa. Severus was an born an African, and some portraits show him as such. As a young man, Severus advanced under the reigns of Marcus Aurelius and Commodus. Severus seized power after the death of Emperor Pertinax in 193 during the so-called Year of the Five Emperors. After deposing the incumbent emperor Didius Julianus in a bloodless coup, Severus fought his rival claimants, the generals Pescennius Niger and Clodius Albinus. Niger was defeated in 194 at the Battle of Issus, and Albinus three years later at the Battle of Lugdunum. After solidifying his rule, Severus waged a brief war against the Parthian Empire, sacking their capital Ctesiphon in 197. In 202 he campaigned in Africa against the Garamantes, briefly taking their capital Garama and expanding the southern frontier of the empire radically. Late in his reign he fought the Picts in Caledonia and strengthened Hadrian's Wall in Britain. Severus died in 211 at Eboracum, succeeded by his sons Caracalla and Geta. 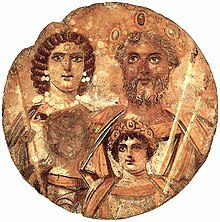 With the succession of his sons, Severus founded the Severan dynasty, the last dynasty of the empire before the Crisis of the Third Century. The Roman Empire reached its greatest extent under his reign – over 5 million square kilometres. According to Gibbon, "his daring ambition was never diverted from its steady course by the allurements of pleasure, the apprehension of danger, or the feelings of humanity". He secured Africa, the agricultural base of the Empire where he was born. His victory over the Parthian Empire was for a time decisive. His policy of an expanded and better-rewarded army was criticised by his contemporaries Cassius Dio and Herodianus. The large increase in military expenditure caused problems for all of his successors. ↑ Gibbon, Edward (1776). The Decline and Fall of the Roman Empire. London: Cadell. p. 96. OCLC 840075577. This page was last changed on 4 September 2018, at 18:01.